I ran into an interesting issue this week trying to image a Surface Pro 2018 with a 1TB hard drive. Some people may ask why I was trying to image this type of device, but that’s a conversation for another day. This device presented a problem because of how the drive is configured. This device actually has two 512GB drives that are presented as one 1TB disk through a RAID configuration. Then the drive is mounted, it mounts as disk 2, instead of the normal disk 0, so my OSD was failing. It was a pretty easy fix, but it took me some time to get there. My task sequence was failing on the partition disk step, as ConfigMgr did not have a drive 0 to target. For these models, disk 2 needs to be targeted. This query targets just Surface Pro’s (older Surface Pros say something like “Surface Pro 4”) and those with a disk mounted at position 2 that also has an interface as SCSI. 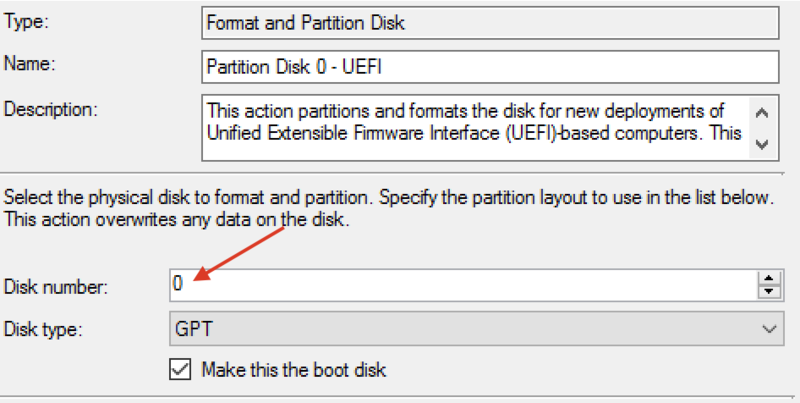 Adding the InterfaceType will prevent this step from executing if it sees a USB drive at disk 2. I think this should be sufficient targeting for a mistake not to be made. The only issue I can foresee is if Microsoft changes the disk configuration in a future model that could throw this off. Note that I left the default configuration and added an If statement with it’s condition to none. Here, the If statement is set to all, so that this step will only run if both conditions are true. After adding this configuration, your task sequence should successfully deploy on a Surface Pro 2018 with a 1Tb drive.